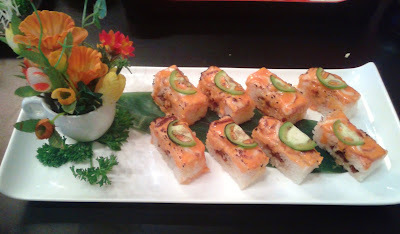 Every time I try to get my mom to experience some of the best Aburi Salmon Oshi in town, something always goes wrong. When I tried to take her to Miku, it was closed and in the process of relocating. When I tried to take her to Victoria Sushi, it was surrounded by police. This time, when I tried to take her to Kishimoto Japanese Kitchen, there were nine parties ahead of us in line. There were probably less than nine tables in the whole restaurant, so we began to head back towards our car. That's when I noticed that the Korean-operated Sushi Ville was located just where we had parked our car and was bustling with activity. I stepped right in and grabbed the second-last available table. 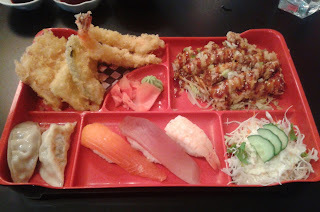 One of the things that we ordered was the massive Sushi & Sashimi Bento, which came with a Miso Soup among other things. 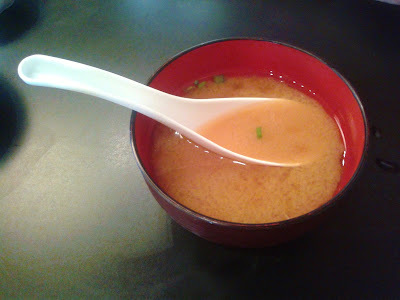 The Miso Soup came with green onion and tofu. I found the Miso Soup quite salty, but my main problem with it was its weird orange colour that made it look like a case of mining contamination. Fear not, I drank half of it and I'm still okay. Whoever made the Tempura managed to wow me by showing me how hard one can possibly make tempura batter. The two pieces of prawn tempura were more like tempura batter disasters with tails. I could barely taste the prawn inside! The kabocha and sweet potato (one piece each) fared slightly better as they were sufficiently sweet and moist. Next up, I tried the Soggy Wonderland... whoops, I meant the Chicken Teriyaki. The pan-fried chicken skin may have been crispy (who knows? ), but ended up all soggy and mushy, possibly due to an overuse of sauces. 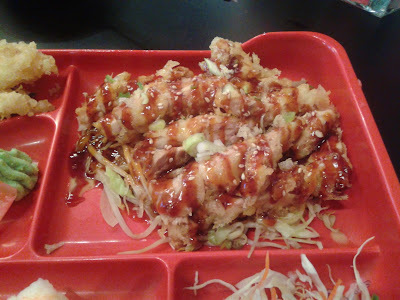 The teriyaki sauce was quite sweet with a hint of spiciness. 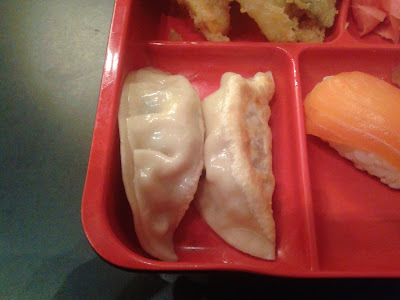 The pork filling for the Gyoza was juicy, but the dough wrapping was devoid of any crispiness. The edges were a little hard too, making the Gyoza a nice workout for my molars. 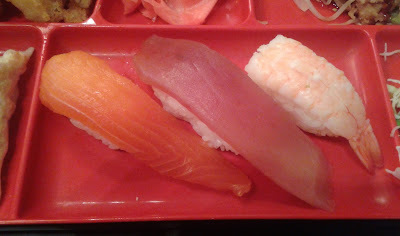 The Salmon Nigiri was underwhelming in terms of freshness and flavour, but at least it had a soft, buttery texture. The sushi rice, however, was horrible. It was mushy and tasted more like steamed rice than sushi rice. It was also compressed too tightly, making it hard to enjoy the softer textures of the fish on top. The tuna was sliced thin and was weak in flavour, while the ebi (shrimp) was sweet and soft. The one thing in the box that actually tasted good was the Salad. 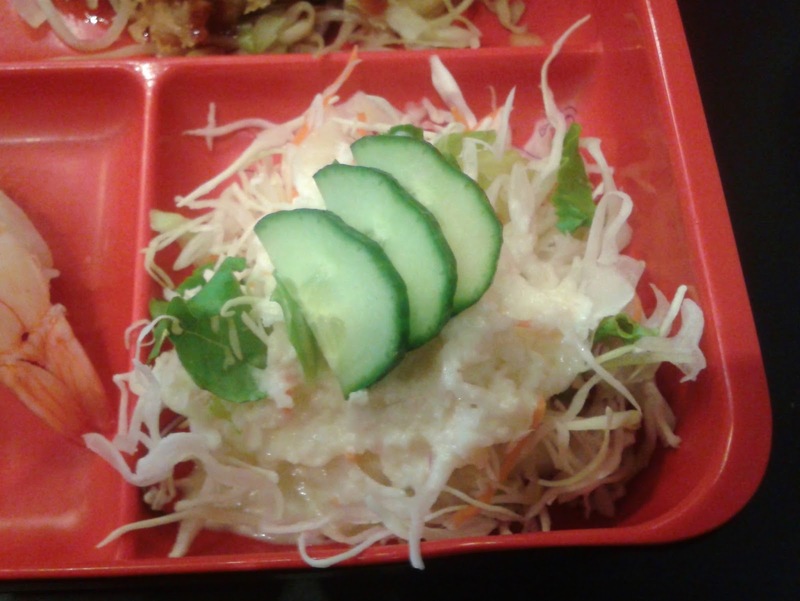 It was essentially a coleslaw with thinly sliced cabbage and a few neatly arranged pieces of cucumber on top. I haven't had a coleslaw in a bento box for a long time, so I found this one quite refreshing. Part 3 of the Sushi & Sashimi Bento came with a beautifully presented plate of sashimi with two pieces of tuna and two pieces of salmon. The Tuna Sashimi was the fresher of the two and had an enjoyable soft texture. 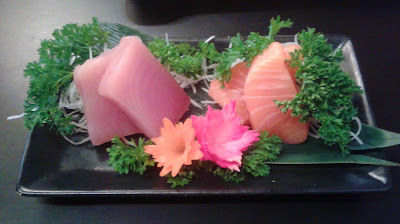 The Salmon Sashimi was cut rather thick, but I found its flavour a bit dull. There were a large abundance of rolls listed on the menu and the walls, and my mom got too excited and tried to make me order seven rolls. Contrary to the laws of physics, I was the one who had to insist on ordering less food. For my special roll, I chose the Dragon Roll, which consisted of cucumber, crab meat, prawn tempura, BBQ eel, avocado, and tobiko. It was neatly constructed, and they took the effort to make it look like a dragon by adding eyes and antennae. The unagi was soft with a smooth texture, and the honey mustard and teriyaki sauce combo worked well with the ingredients inside. 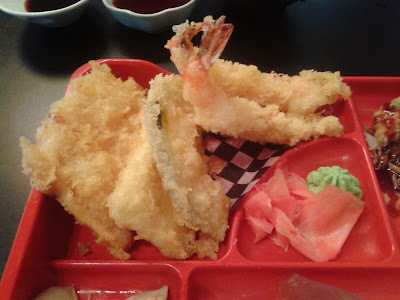 Unfortunately, I forgot that the prawn tempura was going to be rock hard, so I almost managed to injure the top of my mouth when I bit into it. The regular rolls were about as good as all-you-can-eat rolls. The Dynamite Roll was quite large (even though I didn't supersize it) and contained lettuce, cucumber, crab meat, avocado, prawn tempura, and yam tempura. Tempura and sushi rice aside, the crab meat and the avocado tasted decent, albeit a little heavy with mayonnaise. The amount of spiciness in the Spicy Tuna Nigiri was just right, but neither the tuna nor the sushi rice was soft. The Chicken Teriyaki Roll came with a generous amount of chicken, but the chicken here was noticeably worse than the Chicken Teriyaki from the bento and not as tender. The Aburi Salmon Oshi Sushi came with eight large pieces of sushi and an exquisite cup of flowers. The pressed salmon was topped with spicy mayonnaise and thin slices of jalapeño. Inside the rice, there were a few small bits of cooked mushroom, which really enhanced the flavour of the oshi sushi. Yes, that actually worked! There wasn't really a seared flavour, but the toppings were rich with spiciness. This was the highlight of the meal. The two waitresses were friendly, but were also obviously overwhelmed by the number of diners. The service was very sparse, and our iced water was never refilled. The food was very cheap, but the quality was also very cheap. Most of the food was about as good as the food from an average all-you-can-eat restaurant. Perhaps the chef was overwhelmed too! That being said, there are other places that serve budget sushi at a higher standard, such as Sushiyama, Sushi Town, and even Sushi California. Wow that didn't sound like a pleasant experience ! Sorry you had to go through that. Sometimes spontaneous discoveries can unearth gold, but in this case you got pewter. I too was thinking of Sushiyama (but closed on Sundays) or Sushi Loku being the closest good options to Sushiville, other than said Kishimoto of course. Then there's *the* institution of all Japanese restaurants in GVRD, and that is Koko on Hastings just east of Victoria. They've been there since at least the '70s (the first time I went there) and remain Japanese-owned/operated. This was definitely not a pleasant experience... I've had better food at several all-you-can-eat restaurants! I totally agree with you. Sushiyama and Sushi Loku are much better options within the same price range. I've passed by Koko many times, but the lackluster signage and lofty prices have deterred me. Before I started this blog, I used to think it was an auto repair shop! However, I did read Sherman's blog post and I'm determined to give it a try. If they've been around for that long, they must be doing things right! I can go to Koko for a nostalgic meal too !